You know those Facebook friends of yours who are always posting about the healthy foods they eat? We all have a few. You may wonder how a person commits so fully to a healthy diet when the most readily available and tempting foods are quite unhealthy. Well, it’s just a matter of getting started. Once you find out how good it feels to eat healthy – low calorie, nutritious, small portions – you won’t want to go back to your old ways. In order to help you take that first step, Bariatric has made healthy meals the accessible ones. The 2 Week Best-Seller Sampler Bag contains two week’s worth of delicious breakfasts, lunches, dinners and even snacks and desserts. That’s 84 meal replacements for only $150! Where else can you eat that much for that little? The tasty foods in this sample meal plan for weight loss include low calorie versions of some of your favorites: pancakes, Fettucini Alfredo pasta, pizza, banana crème pudding, pretzels, cappuccino and more. Enjoy small portions of all these deliciously healthy foods for two weeks and you will not miss the old way of eating. You’ll feel lighter, happier, and more energetic, something that’s never been said after eating fast food. Aside from helping you feel great, the 2 Week Sampler will help you figure out future healthy meal plans for weight loss. 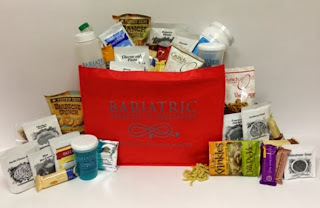 By trying a wide assortment of the bariatric foods that we offer, you can figure out which ones you like best and plan accordingly. No more pushing off a healthy diet because you don’t know what to eat! Try the sampler and get started on the right track right away. Now you can be the one to tell your friends how awesome it is to live a healthy lifestyle.